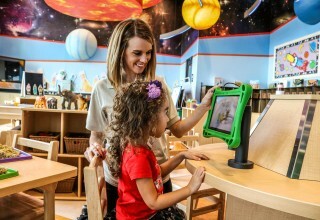 SCOTTSDALE, Ariz., August 10, 2018	(Newswire.com) - Arizona-based Children’s Learning Adventure has implemented a STEAM-based curriculum as an educational approach to integrate Science, Technology, Engineering, the Arts, and Mathematic skills into real-world experiences for their students. Students are introduced to academic skills and concepts in their academic homeroom. These learned skills and concepts are then applied during hands-on activities in specialty enrichment classrooms. Children’s Learning Adventure’s curriculum ensures daily exposure to STEAM-based learning through multiple learning environments. 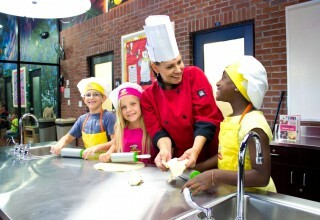 They have created specialty enrichment classrooms including: Culinary CreationsTM – a specialized commercial kitchen where students explore a passion for cooking; Imagination IslandTM – a dramatic play town where students share and develop interpersonal skills; Laboratory LagoonTM – a dedicated math and science environment designed to encourage questioning, experimentation, and scientific discovery; Reading Reef® – a complete library that instills the love of reading with an extensive collection of literary interests; Nature’s NookTM – an outdoor classroom to provide your child with hands-on experiences that lead him/her to a greater understanding of nature and all it has to offer; Picture ParadiseTM – a live TV studio, complete with its own news desk and professional TV cameras. These are just a few of the many specialty classrooms which encourage students to develop new skills. Students begin the day in their academic homeroom, then explore subjects further in specialty classrooms. Each specialty classroom is dedicated to a specific subject so students are given the opportunity to predict, implement, and discover new ideas. 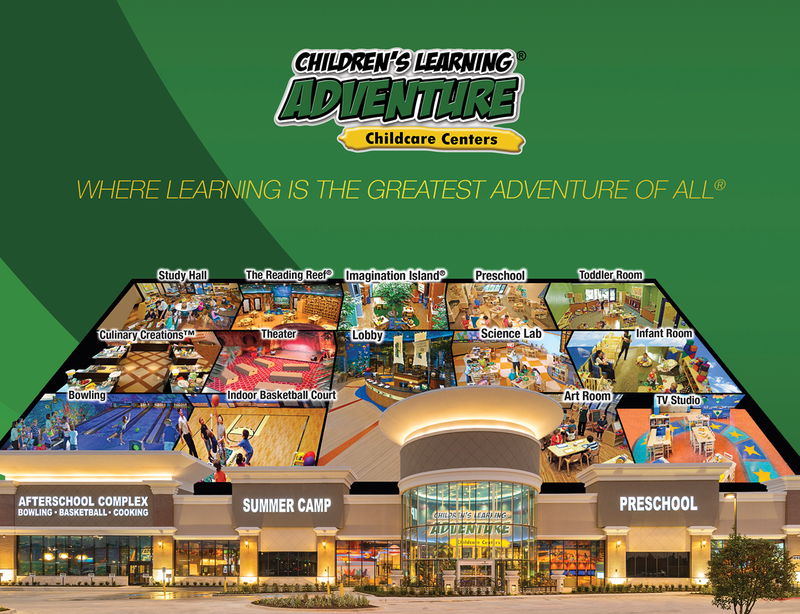 In addition to academic classrooms, Children’s Learning Adventure provides small group instruction in their specialty classrooms daily. One of the most crucial components of learning is the environment, every student’s learning capacity is maximized through multiple learning environments and authentic learning activities. Children’s Learning Adventure’s specialty classrooms ignite student’s excitement in different subjects, through multiple learning environments. Students apply knowledge learned in their homeroom in specialty classrooms. For example, students learning about the weather in their academic homeroom will reinforce this knowledge in all specialty classrooms. While visiting the science lab, Laboratory Lagoon, they may do an experiment about cumulus clouds, then record a weather forecast in the media studio, Picture Paradise. 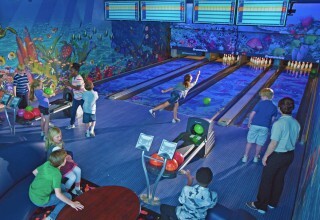 These experiences help students apply practical learning experiences to real-life situations. 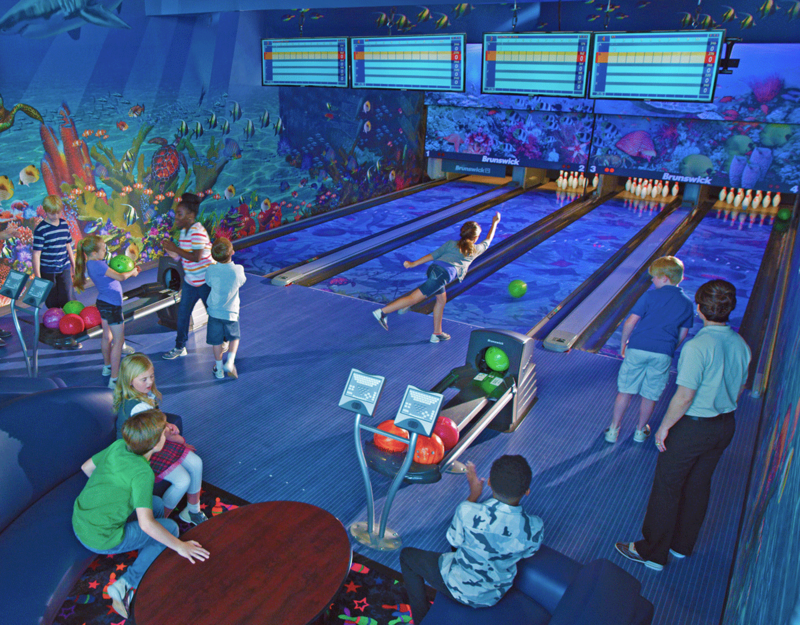 Children’s Learning Adventure campuses not only feature stimulating learning environments as listed above, but integrate those specialty enrichment classrooms with their acclaimed Lifetime Adventures® Curriculum. The development of Children’s Learning Adventure’s Lifetime Adventures curriculum is a collaborative venture between Children’s Learning Adventure’s curriculum writers and early literacy experts. These practices ensure school success by improving the capacity of learning for young students when implementing the entirety of their program elements. 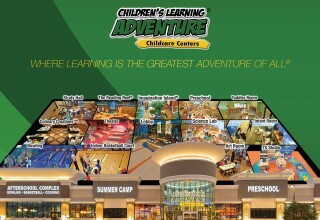 Children’s Learning Adventure is currently enrolling for the fall.